Yesterday’s terrorist attack in Boston occurred at 2:56 p.m., with back-to-back explosions as runners finished the Boston Marathon. Immediately, people took to Twitter, Facebook and Instagram to share news, pictures, thoughts and prayers. By 4 p.m., there were 38,000 tweets containing “Boston.” By 6 p.m., that figure rose to 62,468, and by 7 p.m., the total number of tweets regarding Boston was at 96,923. In the immediate aftermath of what ABC News called “the first terrorist attacks of the social media generation,” social media proved its worth as a source of information. Many people were without cellphones, and those that did have them struggled to get service as heavy usage flooded the cellular networks. Facebook and Twitter were valuable resources as runners and spectators on the scene were able to use tweet their locations to the people they were trying to locate or to alert friends and family afar of their statuses. One such runner, Alison Raitt, couldn’t find her friends after the race, but was able to check their Facebook pages: “My friends finished after me, so the explosion happened right before they finished. They’re all safe, I learned from Facebook — the power of social media,” Raitt said in an interview with ABC. The power of social media surged throughout Monday and Tuesday, with Twitter aggregating all news surrounding the terrorist attack in real time. Through various news sources, Twitter users were updated on the FBI investigation and the death and injury tolls. Many pictures of heroism and tragedy surfaced on Twitter. There were also tweets containing snippets of public statements and Barack Obama’s morning address, as well as myriad expressions of grief and offers of prayers. 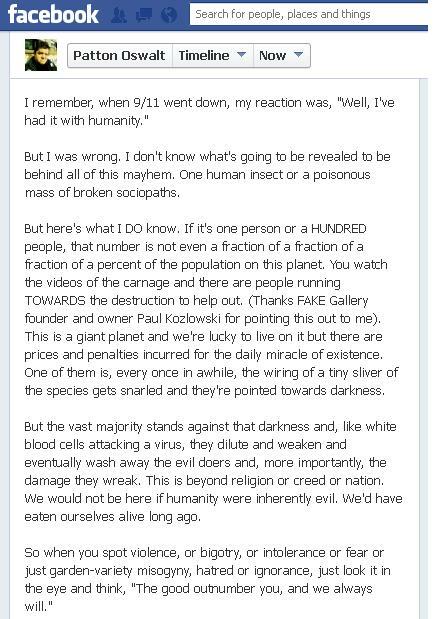 Actor and comedian Patton Oswalt used Facebook to share his thoughts on the Boston terrorist attacks. By the next afternoon, the post was liked by more than 300,000 people and shared by more than 200,000. It also earned nearly 13,000 comments. Meanwhile, Facebook served as a platform for powerful posts that resonated with the nation. Yesterday, actor and comedian Patton Oswalt used Facebook to share his thoughts regarding the tragedy. He issued words of comfort, concluding that “when you spot violence, or bigotry, or intolerance or fear or just garden-variety misogyny, hatred or ignorance, just look it in the eye and think, ‘The good outnumber you, and we always will. '” His post quickly went viral. As of 3 p.m. today, his Facebook post was liked by more than 300,000 people and shared by more than 200,000. It also earned nearly 13,000 comments. (Social media) would have given many the ability to say goodbye one last time, giving some families closure if their loved ones were never found. For others a chance to say they had made it out. Judging by the response to Boston’s terrorist attack, Praetorius is right. Social media has indeed proved itself as a powerful tool in the wake of a terrorist attack. Google also proved useful, launching People Finder, allowing people to share the known statuses of runners and spectators. And in Google Docs, people created a live document where Boston residents were able to offer their homes to those who had been evacuated from their hotels. As of 5 p.m. today, there have been 244,332 tweets about Boston. That number will assuredly increase as more becomes clear about yesterday’s events. How has social media changed affected your experience of a crisis or disaster? Share with us in the comments.